Welcome to the April newsletter of the IRF Geneva. Over the past weeks we have been very busy preparing for the IRF Symposium 'Providing infrastructure that improves Road Safety', taking place on 10-11 May 2011 in Bucharest, Romania, as well as organising the official public launch of the UN Decade of Action for Road Safety. We hope that you will be able to join us at these landmark events in Bucharest. As the planned Environment conference in Cairo had to be postponed, we are organising an IRF Environment Study day in Geneva (Switzerland) on 23 June. We have limited places available. The seats will be allocated on a first come – first serve basis. See the news below for more information. 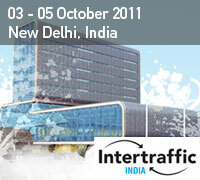 The IRF Regional Conference on Road Safety and Intertraffic exhibition to be held in New Delhi, India from 3 to 5 October. The exhibition packages and preliminary programme for what promises to be another exciting event, can be downloaded from here. The IRF International Road Congress “Innovation in Road Infrastructure”, to be held in Moscow from 22 till 24 November 2011, is now integrated as a key event in the framework of the Russia Transport Week 2011. It provides excellent business marketing and communication opportunities, please have a look at the preliminary programme and sponsorship packages here. We are also working hard to restructure the working groups Road Safety, Road Finance & Economics and Environment to better respond to your needs and the challenges of the road industry over the next years. If you would like to contribute to any of these groups, please send an email to info@irfnet.org. We are developing the Maintenance module of CHANGER, the IRF Greenhouse Gas Calculator. If you can contribute to this new module, we encourage you to contact Susanna Zammataro at szammataro@irfnet.org. We are still looking for some experts to advise and test our work. Last but not least, have a look at the short video of CHANGER and don’t miss to place your order now. It is an important part of assessing the environmental footprint of road construction activity. Enjoy reading the news and looking forward to your comments and suggestions. The 13th meeting of the UN Road Safety Collaboration met in London, UK from 11-13 April 2011. Over 70 stakeholders from all parts of the world gathered to discuss the upcoming launch of the UN Decade of Action for Road Safety (2011-2020). The concept of Green Public Procurement has been widely recognised in recent years as a useful tool for driving the market for greener products and services and reducing the environmental impacts of public authorities’ activities. The International Road Federation’s presence at the Third Session of the UNECE Team of Specialists (ToS) on PPP was both rewarding and constructive. The 2-day Conference, held at the UN Palais des Nations in Geneva, was attended by IRF’s PPP expert Caroline Visser, and IRF Road Finance intern Paul Bossidy. Take two minutes to watch the new video of CHANGER – the Greenhouse Gas Calculator for Road Infrastructure developed by IRF. Learn about its functionalities and assets. The IRF Policy committee on Intelligent Transport Systems met in Stockholm, Sweden, on 9 & 10 March for its 5th working meeting. The second preparatory meeting of the Economic and Environmental Forum - organized by Office of the Co-ordinator of OSCE Economic and Environmental Activities in co-operation with the Lithuanian Chairmanship - was held in Druskininkai, Lithuania on 4 and 5 April 2011. The 64th Biennial Session of the UN Economic Commission for Europe was held in Geneva from 29-31 March 2011.